Man, Orange is flooded with cheap pay as you go phones this Christmas so if you're hunting for cheap mobile phones to give as a gift, Orange is the place to go. This week, we have the Orange Rio Phone to review. So, is this a good phone? Let's find out. Although the Orange Rio comes cheap, build quality isn't bad. The phone is made out of all plastic with a chrome finished bezel to keep the phone from looking like a toy probably. One thing I like best about the Orange Rio is the keyboard. It's spacious and has a really nice tactile feel, great for text addicts. But the icing on the cake here is that for £49 you get a physical QWERTY keyboard on a phone plus touchscreen. That's right, touchscreen. 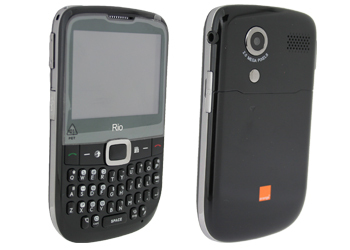 The 2.4 inch screen on the Orange Rio is a resistive one. Other hardware goodies include an on board 3.5mm headset jack and microUSB. Being a china made phone, don't expect the OS to function smoothly. The touchscreen responsiveness is good although sometimes it good get laggy and you have to really press the screen in order for it to respond. You get three homescreens which you can fill up with widgets. It used to be that only smartphones can do email on your phone but nowadays, every phone can do it including the Orange Rio. You can set up your email from various email accounts such as Google, Yahoo and Hotmail. Set-up is easy and you can set your phone to retrieve messages for you at your chosen interval (5 mins, 30 mins, 1 hour, etc). Of course, it's not true push email like on the Blackberry wherein emails sent to you are received real time but for £49, what can you expect? As for multimedia, you can store your music on the Orange Rio, it supports microSD slot. Audio quality is good although probably not as good as the cheap Samsung phones but it's good enough for a phone at this price point. There's also a built in FM tuner which is an added bonus. Again, most mobile phones below £50 don't have 3G or WiFi and your stuck with EDGE speeds on the Orange Rio. The Rio has Opera Mini as its browser which is great, browsing is better compared with the stock browser on the Samsung Libre. As for social media, you can do that on the Opera Mini browser, there's no widgets with real time updates like on the Samsung Genio. 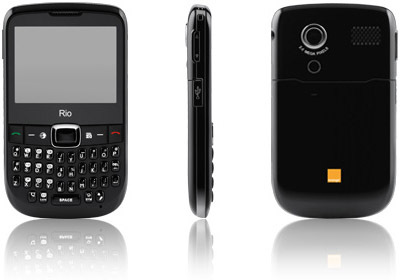 The Rio is equipped with a 2 megapixel camera. It has a higher resolution compared with the Libre but, here's the big BUT and proof that the higher resolution a camera has doesn't mean it has better picture quality. Picture quality on the Orange Rio is subpar, not great in dark areas with night mode on and daylight pictures are washed out. Again let me reiterate, for £49 you get a touchscreen AND a physical QWERTY keyboard? Who's complaining. Sure, the software isn't as good as the ones on Samsung or LG phones but hey, since when did both of those Korean manufacturers released a sub £50 phone that has a both a physical keyboard and touchscreen? The Orange Rio would be a great choice for avid texters who don't want to be separated from their physical keyboards just yet but want to dip their toes on the touchscreen world as well. Let's not forget that design-wise, because it looks like a Blackberry, people won't think that you're lugging around a £50 phone, that alone is reason enough for me. How does this compare to Samsung Genio QWERTY? I'm torn between the two phones. The Samsung Genio QWERTY has a much faster interface although it lacks the touchscreen keyboard that the Orange RIo has. Personally, I think you'd get much more bang for your back with the Rio because its a newer model. Hey! this is a FABULOUS PHONE! I would totally say its better than a blackberry and it is very affordable and cool! i would recommend it to ANYONE!! I have the same problem as jess, i've searched for 3 weeks and i've searched everywere! Nothing exept leather or flip ups. its an ok phone and its indistructable almost when you drop it but i've had to send it back twice because the buttons kept falling off n the back snapped.